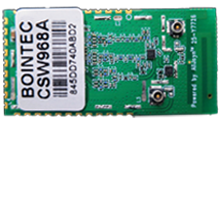 Bointec CSW868A module with a built-in printed antenna is an intelligent Internet of Everything (IoE) platform which can be powered by Alljoyn with low power wireless connectivity.This completes networking platform enables customers to add full-featured Wi-Fi to a wide variety of products with minimal development effort and cost. It supports a network stack along with SSL security, enabling full-featured internet connectivity and reliable information exchange in a small, low-cost system.The CSW868A module contains a Qualcomm® QCA4004 chipset. The QCA4004 is a single chip system on a chip (SoC) 1x1 802.11 b/g/n device optimized for low-power embedded applications with single-stream capability for both Tx and Rx. It has an integrated network processor with a large set of TCP/IP with IPv4/IPv6-based services. 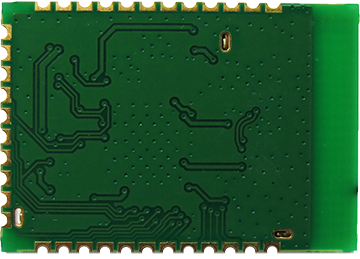 The CSW868A provides UART-based host and SPI slave interfaces for connecting to local system controllers.